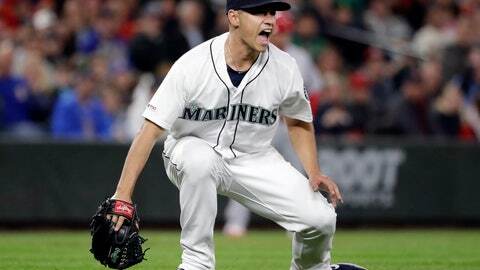 SEATTLE (AP) — Marco Gonzales and Scott Servais had a little argument after the eighth inning. Gonzales, Seattle’s No. 1 left-hander, wanted to finish what he started. As his manager, Servais wasn’t looking to push Gonzales’ pitch count too early in the season. Gonzales pitched into the ninth but couldn’t quite finish up after Dan Vogelbach hit a tiebreaking homer an inning earlier. Anthony Swarzak, coming off the injured list, finished up the Mariners’ 2-1 win over the Los Angeles Angels, which propelled them to 7-1 for the first time in franchise history. Vogelbach homered off Luis Garcia (0-1) and also doubled in the third inning. He didn’t know he was starting until an hour before the game when Edwin Encarnacion was a late scratch because of left wrist discomfort after getting jammed in an at-bat Monday night. Mariners: LHP Yusei Kikuchi (0-0, 2.53) will make his third start Thursday in Chicago when the Mariners start a three-game series against the White Sox. It will be Kikuchi’s first start since his father died of cancer over the weekend. The Japanese pitcher chose to remain with Seattle, respecting the wishes his father expressed when they last saw each other during Seattle’s season-opening series in Tokyo.